Posted on December 22, 2009	by Michael Gorton, Jr. Recently I was elected to the Position of President of the Medford Chamber of Commerce. I was asked on twitter what my celebratory wine would be. I really had to think. It was easy to go to a desert wine after the meeting. Or I could have popped the cork on some bubbly. Or some seductively good desert wine. While I drove home I was thinking, what is the best bottle you have that you have not opened yet. My gut was telling me one thing, but I went with what my head was telling me. 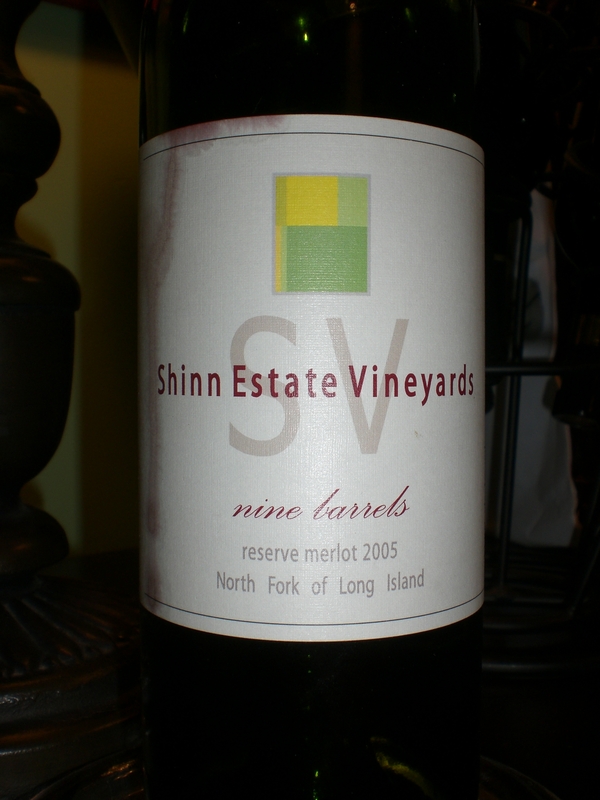 Shinn Estate Vineyards 2005 Nine Barrels. 2005 was a great year, until, the rain came. Then there were folks that built arc’s and left the island, from what I am told. Some vineyards picked before 20 some odd inches of rain fell. Some picked after the rain and some lost their crop. A real mixed bag of wine from the 2005 vintage. This wine was picked after, David Paige and Barbara Shinn decided to hold out and take the chance and wait, and wait…and wait. And boy where they lucky. Their Nine Barrels is a blending of the best barrels in their cellar with the bulk of the wine being Merlot. On the nose, I was getting chocolate, licorice and some blackberry jam and some ripe red currants. I was picking up some plum and tobacco with a hint of exotic spice with the touch of vanilla. The exotic spice is one that I seem to find often in Shinn Estate Vineyards, which is delightful. The elements that I was getting on the nose were some of the same elements I was getting on my palate. The spice on the nose was not as strong. I was picking up some toasted nuts too. There was an earthy minerality that I was really getting into. The earthy element was the aroma of fresh picked mushrooms. And the mineral element was a wet slate aroma on my tounge. This is not in the tasting room anymore, I don’t want you to get to excited over this and run out and buy it. But if for some reason you find it someplace, pick it up. You will not be disappointed. So on the night I was elected president of the Medford Chamber of Commerce, I toasted with this wine. This wine got my vote of praise, just as I did that nigh. Thanks for the comments on the Nine Barrels. Hopefully we’ll still be drinking this one in 10 or 15 years. Congrats again on the Chamber! I think I have two left…I will be patient and wait!